One of your training benefits as you study and graduate with Study in Style is the opportunity to join a Consultant Meeting. These meet ups are held at least twice a year and usually involve a group of consultants getting together in a training room to discuss industry developments, share best practice and to build great friendships. Consultants came from around the UK to join me – Natasha from Newcastle-Upon-Tyne and Paula from South Wales won the prizes for the furthest travelled! 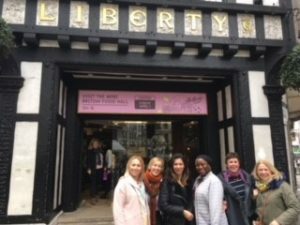 We started by looking around the amazing Liberty Store which has been on Great Marlborough Street (just off Regents Street) since 1924. The architecture and design inside is incredible – all wooden panels and floorboards – wonderful to imagine all the people who have walked those floors over the years…. We strolled around the accessories and womenswear departments – spotting the designer trends that will be filtering down to the high street. We noticed lots of sleeve details, unfinished and asymmetric hems, clashing patterns and pleats. 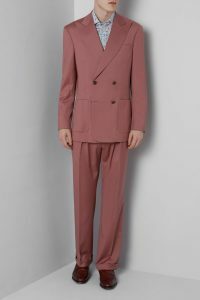 We then walked down Saville Row – the traditional centre of men’s tailoring in London – this is THE place to come if you want a bespoke suit made. it was interesting to wander in out out of the different stores – some very traditional and other more contemporary brands like Ozwald Boateng and Richard James – it looks like they are embracing a return to double breasted suits and double pleated trousers…..
We then had a well deserved stop for lunch at the gorgeous vegetarian restaurant Tibits. Suitably re-charged we wandered down Bond Street with a stop inside Louis Vuitton to enjoy the bags, accessories, clothes and store design. And then a look at the fabulous Easter decorations outside Fenwicks. Our final stop was in John Lewis where everyone got the chance to work with a partner – selecting a variety of garments to suit them. And as an extra bonus we watched a short fashion show!! It was a lovely day – a chance to learn, network and indulge in some retail therapy!